Halfords has created a special press ad showing a crown with bike helmet straps to celebrate Chris Froome's victory in the Tour de France yesterday. The ad is in two parts across a double page spread. The left hand side features a gold bejewelled crown with straps to resemble a bike helmet and the words "All hail King Chris". 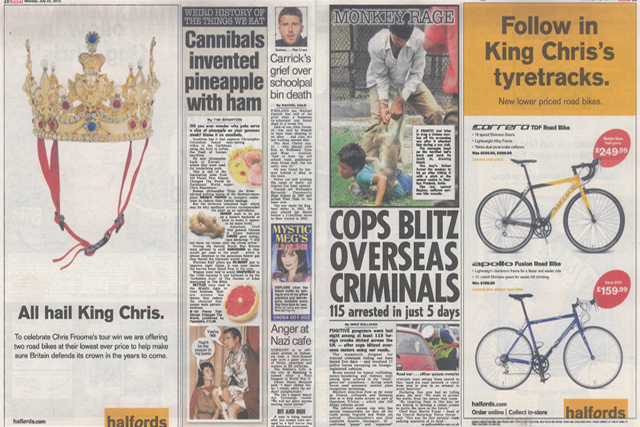 The right hand side of the ad features text that reads, "Follow in King Chris’s tyre tracks" alongside photographs of two road bikes at their lowest ever price. Halfords hopes these bikes will help to "make sure Britain defends its crown in the years to come". Mother created the ad with planning and buying by Walker Media.